Dominico Cabral, a native of the Dominican Republic, defends his nation’s policies and says there is no racism there. They are among the pillars of the Dominican community in Massachusetts: Junot Diaz, the Pulitzer Prize-winning writer and professor at MIT; Dennis Benzan, the vice mayor of Cambridge; and Hector Piña, the owner of a Boston restaurant. But in recent weeks the men have been assailed as traitors against their country, and worse, for criticizing the Dominican Republic’s citizenship policies toward people of Haitian descent and engaging in a thorny debate over racism. Some called for Diaz to be charged with treason. Others vowed to oppose Benzan in the coming elections. Another allegedly brandished a baseball bat at Piña. The backlash reached fever pitch earlier this month when Piña filed for a restraining order against a Boston television host who posted the three men’s photos on Facebook and told his 4,300 friends that the men were trying to “damage the Dominican Republic.” That day, Piña said, he received multiple death threats. He later withdrew the complaint against the host, David Suazo, after the two reached a confidential agreement. That country’s highest court has thrown nearly a quarter of a million migrant workers into a stateless limbo. Suazo said he was defending the Dominican Republic from criticisms that endangered the country’s economy. 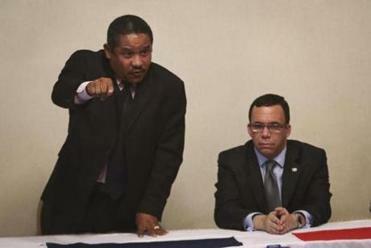 The three men do not support calls for a travel boycott to the Dominican Republic, but Benzan and Diaz had appeared at press conferences with people who do. “People are disappointed in them,” Suazo said in an interview. The uproar stems from a 2013 constitutional court ruling in the Dominican Republic that stripped birthright citizenship from an estimated 200,000 children and grandchildren of undocumented immigrants, mainly Haitians, retroactive to 1929. 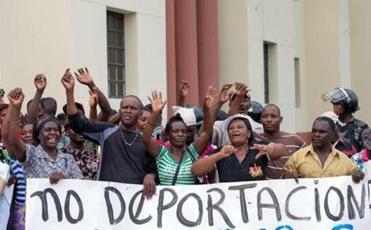 Critics decried the ruling as another example of racial discrimination by the Dominican Republic against people of Haitian descent. In the aftermath, thousands of Dominican Republic residents have fled to neighboring Haiti and tensions have intensified between the two countries. Dominican officials deny that racial discrimination is widespread — saying their laws forbid it and roughly 80 percent of the population is of mixed race. And they point out that since the court ruling, the government created programs to help undocumented residents obtain citizenship. They also allowed foreign-born workers to apply for legal residency. “The Haitians are accusing us of racism because we’re imposing our laws,” said Dominico Cabral, a local Dominican leader and the nation’s former consul in Boston. Haitian officials had no comment on the race debate, though they said they hoped for a peaceful solution to the crisis. “We don’t want any confrontation whatsoever,” said Bocchit Edmond, Haiti’s ambassador to the Organization of American States, which is trying to ease tensions over the citizenship issue. The US government has asserted for years that the Dominican Republic has a problem with racism. In its 2014 human rights report, the State Department said Haitians and others have been refused access to banks, denied service in restaurants and stores, and barred from private schools. “There was significant evidence of racial prejudice and discrimination against persons of dark complexion, but the government denied that such prejudice or discrimination existed and, consequently, did little to address the problem,” according to the report. Critics fear the problems are playing out again in the Dominican Republic’s new citizenship program. In June, Benzan and others on the Cambridge City Council unanimously passed a resolution accusing the Dominican government of deporting people arbitrarily over the prior six months and “randomly” stopping people and asking for their legal papers based on the color of their skin. But Andres Navarro, the Dominican Republic’s foreign minister, said the debate is rife with “distorted information.” Officials say nobody has been deported since the court ruling in 2013, and they have vowed not to deport citizens. In recent days, he met with Dominican communities in Boston and New York to provide the government’s version. But Benzan said he has repeatedly experienced racism in the Dominican Republic, his father’s homeland. One night in 2004, he and Diaz said, a bouncer refused to let them enter a Santo Domingo nightclub because of their dark complexions. The manager told them they had “limitations.” Piña, who was also there, said he was shocked to tears. All three men confirmed the incident. Now the men say they feel compelled to confront racial discrimination — here and in the Dominican Republic. “The folks who pretend that there’s nothing wrong, who say there’s no racism in the DR . . . aren’t helping the situation at all,” Diaz said in an e-mail. “We just want to open a dialogue,” Piña said in an interview. Maria Sacchetti can be reached at maria.sacchetti@globe.com. Follow her on Twitter @mariasacchetti.